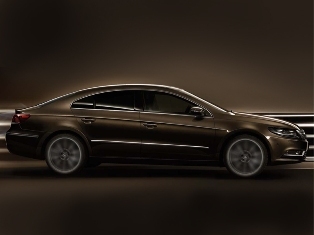 Seen last year at the LA Auto Show is the Volkswagen CC, the 4 door coupe model which was launched recently. Measuring at 4,802 mm long, 1,855 mm wide and 1,421 mm tall, there will be 2 trim models available in the CC and it will be the Comfort which is priced at RM226,967 and the Sport version which is sold for RM244,967 where they come with a 5 year warranty as well as a 5 year mobility quarantee, much like the rest of the new VW models. In the CC, you will like the standard fittings which include bi-xenon headlights, LED tails, 17 inch ‘Phoenix’ alloys as well as LED daytime running lights, pretty much the standard these days. They have made the CC more elegant and luxurious to distinguish it from the other siblings while it also come with the CLIMATRONIC control panel as well as a multi-function leather-wrapped steering wheel, powered front seats, and a RCD 510 touchscreen entertainment console that comes with a 6 CD changer and 8 speaker system layout. Under the hood is the 1.8 liter TSI engine mated with a 7 speed DSG gearbox that requires only 8.5 seconds to reach the century mark.